The beautiful Yu Lei Mountain will lend its spectacular scenery to the Forest Art Chengdu project, which was envisioned in March 2015 walking the old Song Mao merchant path between YuLei Gate and West Gate. The slowly flowing Min river and the sight onto the 2300 year old dam have been the inspiration for an art project which combines Forest Art and Land Art. Flowing Inspiration will bring together the aspects of this historic place and the contemporary nature art based projects which will be created alongside the ancient path. The Forest Art Path has a length of about 2 km and will be a pleasant walk nearby the river. Dujiangyan and the Min river offer a very inspiring place between history, present time and future. 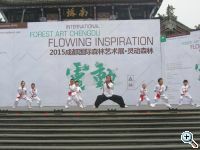 So the idea of Flowing Inspiration came from the presence of the flowing river and the nature, the historic invention of the dam and irrigation system by Li Bin, the Tao temples around the whole area and the future projects and inspirations coming to the booming Sichuan and Chengdu area. 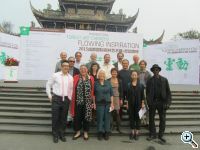 The international artists will realise their flowing and inspiring ideas on the site of this cultural heritage. 15 invited artists from 10 countries will create a series of installations, actions and talks during a three week artists symposium, they come from: Argentina, Belgium, China, Cote Ivoire, France, Germany, Great Britain, Italy, Netherlands, South Korea. 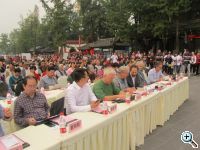 The plan is to create a Forest Art Path in Chengdu with art works connected to sustainable ideas, using natural materials and also representing the process of art production. Some of the art projects will be interactive. The artworks are mostly based on materials like wood, branches, bamboo and wicker. There will be two textile structures - one made of cotton and one made of wool. A canopy build of copper and brass will stay for a long time and reflects the history and presence of the Yu lei mountain. Two installations use the idea of Eco Art and will integrate recycled materials like glass bottles or the typical blue and white porcelain. All artworks depend on the processes in nature and will stay and decay depending on their material. This installations come from the idea of Sustainable Art, they are sitespecific and process oriented, they use the history of the place and often also the regional materials. Most of the art projects will invite the visitors to react and start interaction with them: to enter them, to sit on them, to climb them or just get into the feeling of the artistic space they created. During the three week symposium while the visitors of Yu Lei Mountain can see how art works are created and also can meet and talk to the artist, we will have a series of talks, a forum for discussions and performative actions by two regional artists. The aims of German based Forest Art projects is to bring together the creative power of the forest and the artist . All art projects are within an international context, follow sustainable aims and create a pedagogical and theoretical environment for artworks in forest and nature.